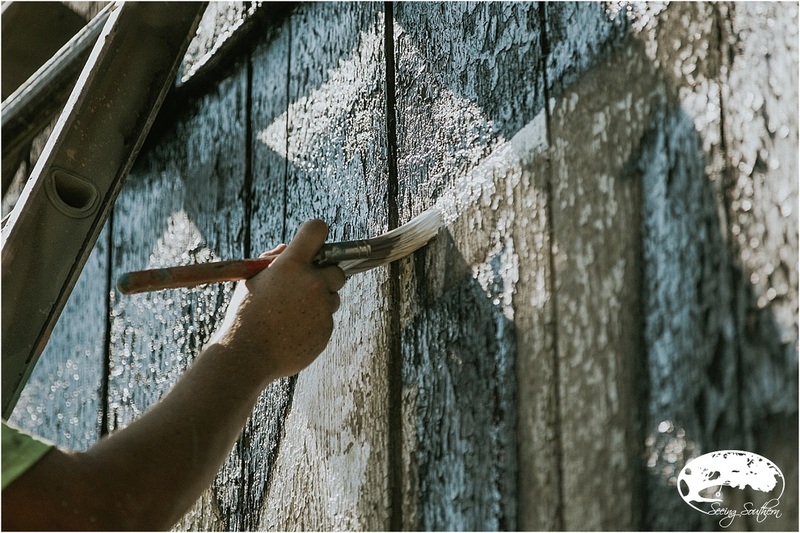 Long ago, in the early part of the twentieth century, some ingenious people had an idea that the side of a barn is a perfect canvas for advertising. Not just any barn, but a barn that edged close to a main thoroughfare, watching cars whisk by day-after-day. These roadside barns would become the stuff by which road trips would be defined. Families setting out for their yearly vacation, cars stuffed with suitcases and children. Looking out the window, watching the landscape rush by, became the major source of entertainment. And when you see something larger than life telling you a place you need to be, well, it might just change the course of a family's direction. That's exactly what the advertisers hoped would happen. There's the Mail Pouch barns found mainly in the North. The Bloch Brothers Tobacco Company began on sides of buildings, then moved to barns by 1925. At its height in 1960, some 20,000 barns in 22 states said "Chew Mail Pouch Tobacco." 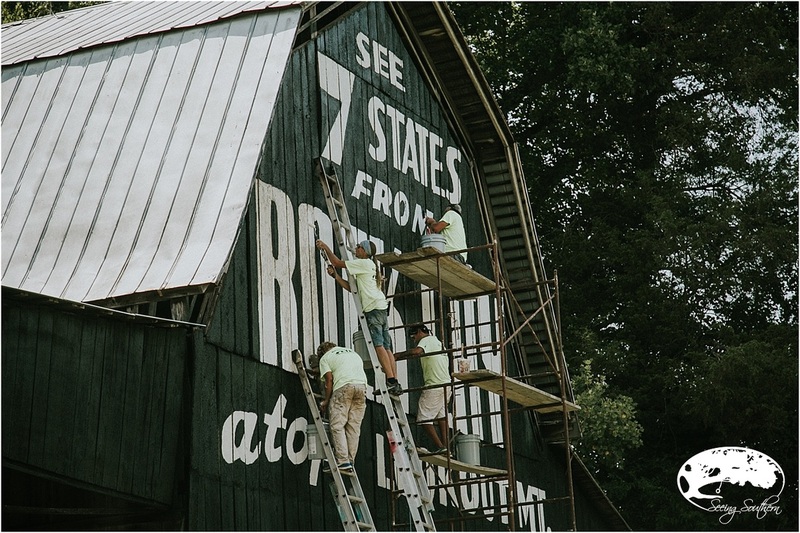 In the 1940s, Clark Byers told Rock City near Chattanooga, Tennessee, his idea of painting barns and what a great mode of advertising it would be. He promised travelers you could see seven states from the top of Lookout Mountain. They would make an arrangement with the property owners in exchange for the use oftheir barn: free passes to Rock City, an armload of promotional wares (thermometers at that time), or even a lease. If the owner didn't need thermometers, they received a hardy $3. The owners of Rock City fell in love with his first barn. Then, as he would find another, he would ask them if it would work. They soon realized that every barn he picked was a good barn. They said, "Go and paint." For the next 40 years, that's all he did. All the way from Michigan to Florida. 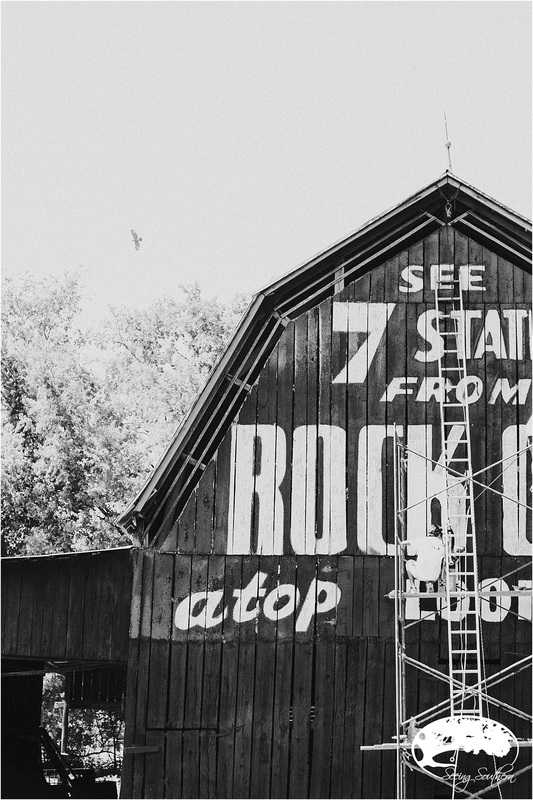 Nineteen states and 900 barns later, "See Rock City" caught everyone's attention. In 1946, Rock City started using billboards along the Interstate system. Today, we are in Maryville, Tennessee, at the Cross the Creek Farm. 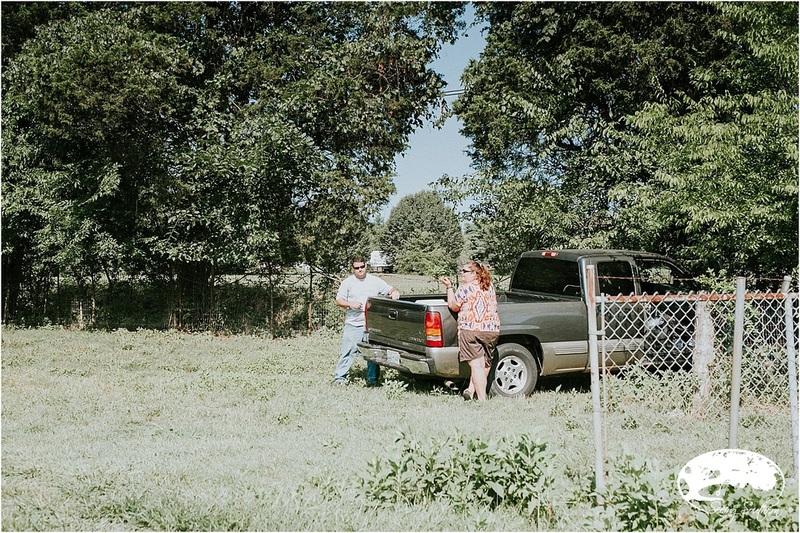 The owners, Robert and Elizabeth Cross, and their family have been on this land for generations. Their barn, a National Landmark Barn for Rock City, needs a make-over. 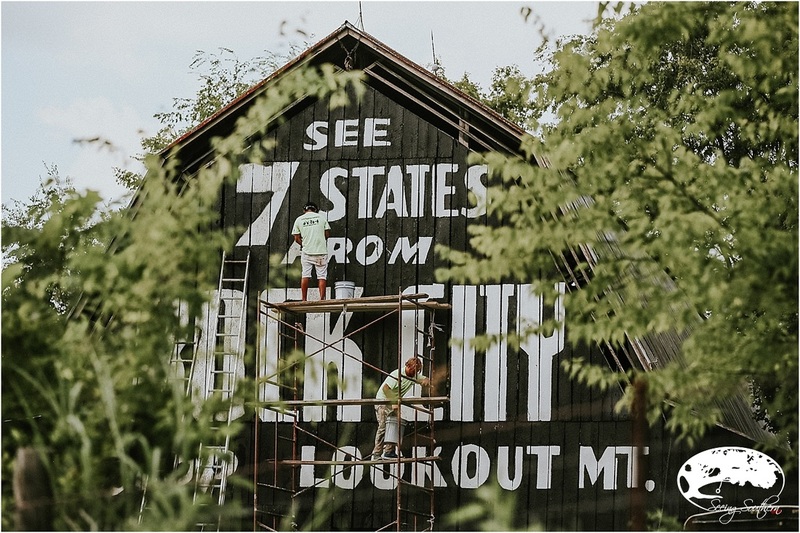 The barn was built in 1926 on this heavily traveled road and was painted with the iconic message in 1962. Of the barns in general, Roy Davis, general manager of R & R Outdoor, says, "it's [the barns] a Southern icon. It just draws the people to Rock City. Unfortunately we're losing them to the Interstate system. This is as much a part of Rock City as the rock formations themselves." 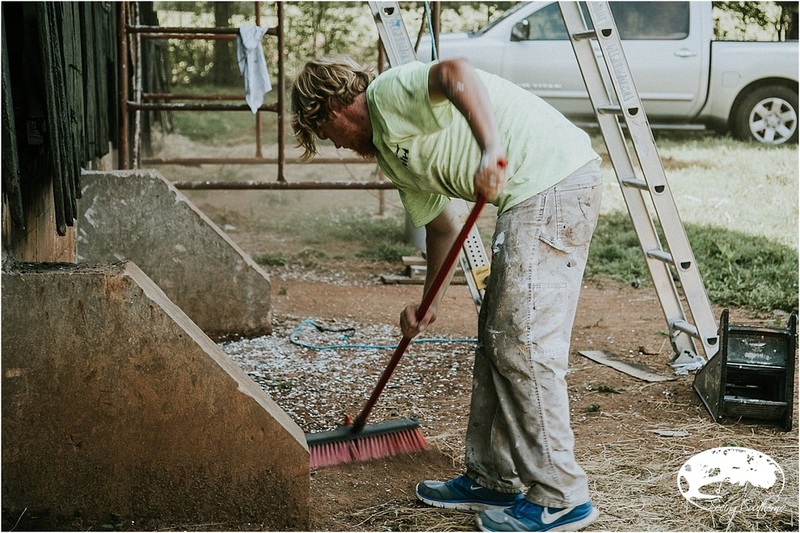 The Cross family contacted Rock City about the condition of the barn, asking if they could repaint or if Rock City would be interested in refurbishing. 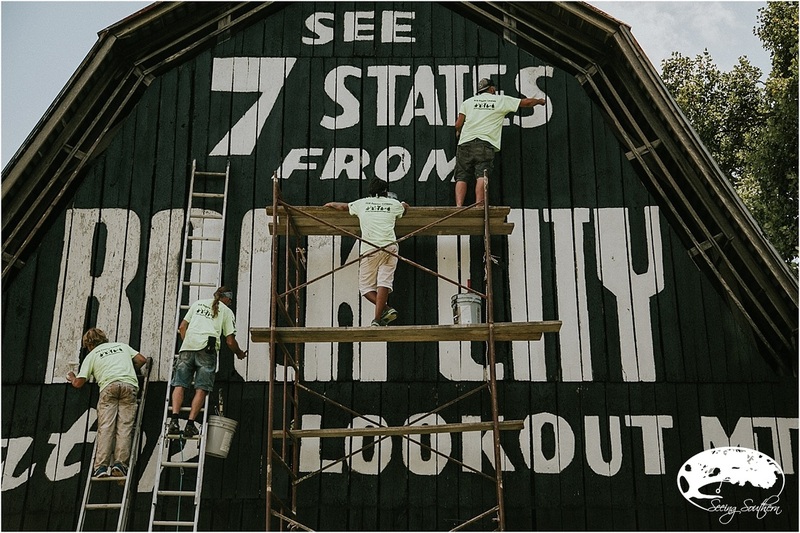 Rock City made a visit and deemed the barn as one that needed painting as well as in need of some structural repair. 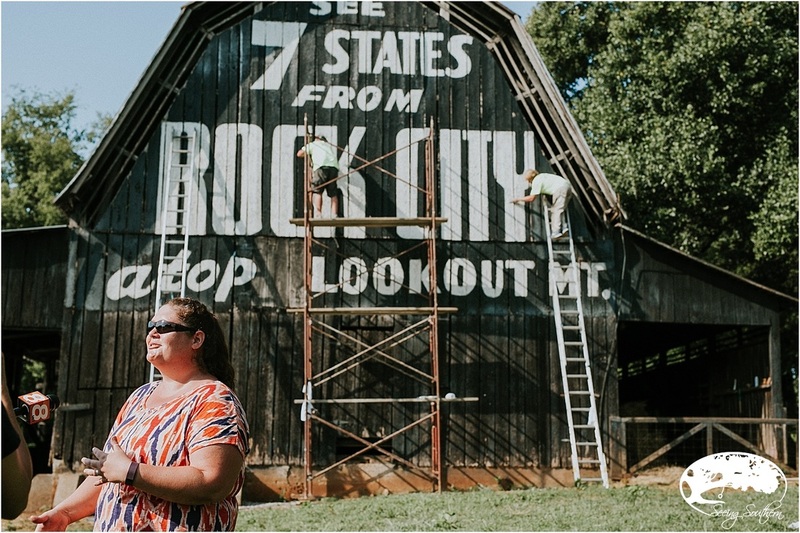 Rock City's official painter - H and M Painting of Chattanooga - has been painting barns for about two years.It started with baby steps, teaching them how to complete the process. It's much more than just "painting" says Davis. They were recommended to Rock City once Clark Byers and his family retired. H and M agreed to try one barn. "It was a miserably hot day. They finished it. They came off and said, 'when's the next one.'" " What we're trying to do is obviously advertise for Rock City, but we're also hoping to preserve this for future generations," says Davis. "We've had grandparents bring their grandchildren to Rock City. The first thing they say is their first memory of coming into Chattanooga is seeing the barn. We did that for our kids. Now they are bringing their kids. Unless we're able to preserve, there will be none left." Barn paintings are not on a schedule. Trying to paint five barns a year, Rock City is working with the land owners that have contacted them. They weigh their options as to whether it is still advertising for Rock City. At one time there were 900 barns; now, only 62 barns remain. The majority of barns are in Tennessee. "If you've traveled, you've driven by a Rock City barn," says Davis. Cross the Creek Farm is a working farm, with their primary livestock being Nigerian Dwarf milk goats. It's "pretty awesome" say Elizabeth Cross of the entire barn painting affair for she knows that the structure will be home for over 100 beautiful souls. Cassidy (left) works on the farm, knows every goat's name by heart. The only one of more importance is Smokey, the dog and protector of the goats. Rock City makes a site visit to assess whether or not the barn will be maintained as one of the historic buildings. In this case, the president made a visit to Elizabeth and Robert's farm, and he gave the thumbs up for restoration and painting. 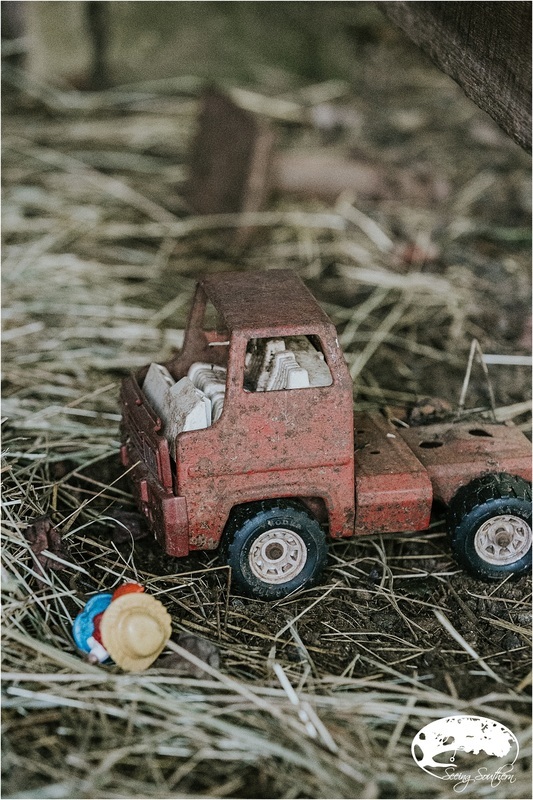 The barn's 90 years of age was beginning to show; not only painting the exterior was required but stabilizing the foundation and making this barn equipped to be shelter and storage for animals and owners alike. Not moved in the least by the painters and crowds at their normally quiet spot, the goats continue their daily ritual of . . . grazing. 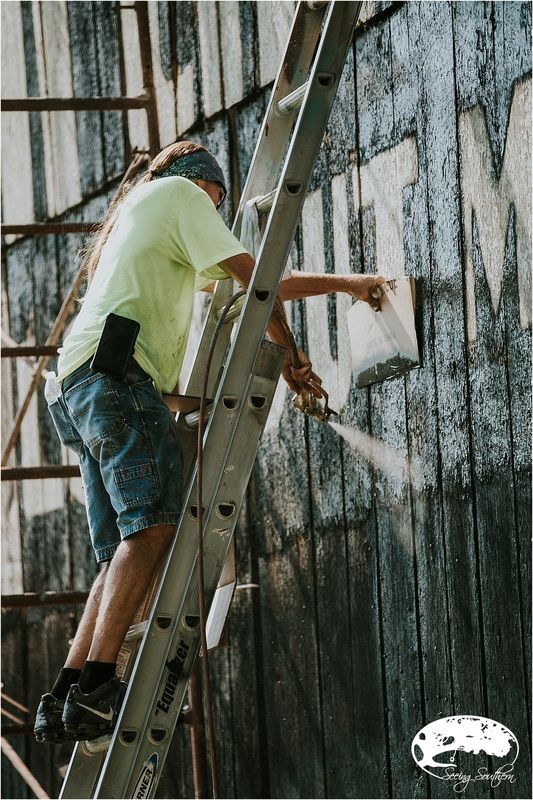 Once the painters arrive, the process of scraping the loose, weathered paint from the boards begins. From top to bottom, black areas and white, the hanging specks are dropped to the ground. It's July in Tennessee. There are times when the temperature gauge in my Jeep reads 102 degrees. Robert Cross (below right) is the third generation on this farm. William Edgar Reaves, great-grandfather. Robert's granny - who grew up here - went into the army to teach soldiers how to read, sent money home to help build the farm house; the Crosses live in the original farmhouse. The original farm was around 130 acres; today, they have 27 acres. As far back as Robert can remember, the barn has been painted. "My great-uncle used to raise cattle on this property, and he used to put square bales in the loft. I want to say I was about five or six, and he probably had 1,400 bales in that loft. It was completely full. That's probably the first memory I have." Elizabeth shares that Robert used to jump from that loft into the soft hay below, channeling Superman. Oh that was "years later," Robert laughs. They have lived here since 2008 and the barn has not been painted since they have moved in. Fearing they would lose the barn due to structural damage, they contacted Rock City regarding repairs. 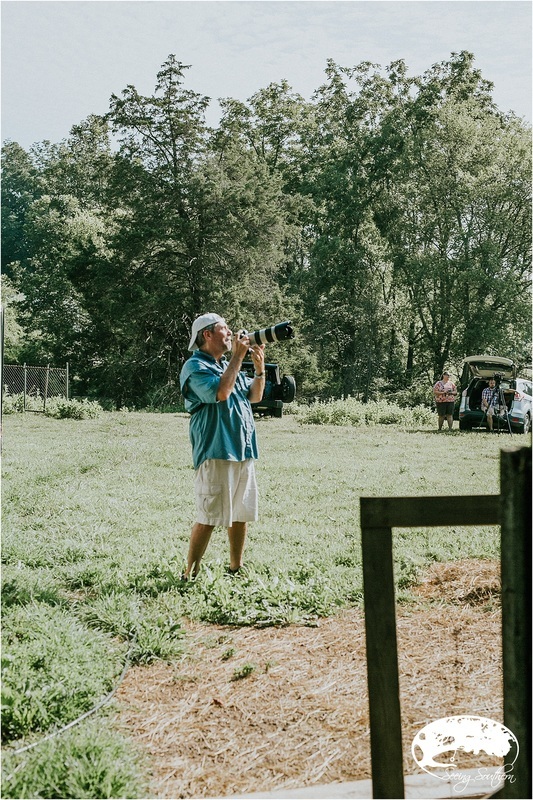 Since it was considered a Rock City National Landmark barn (one that has been photographed extensively and sits on a well-traveled road), it was go! The Crosses are still compensated by Rock City, and last year, they took their son Benjamin and made the two-hour trip to Rock City to see the Christmas lights. "He loved Rock City," says Elizabeth. People continue to stop and take photos. "They'll stop at the barn or pull in our driveway or stop on the road. All the time." Oddly enough, the next closest barn with the famous saying is only a half-mile down the road facing the opposite direction, the only two in the county. Thirty six year old painter Scott Hoskins (below) remembers barns. "I remember going to Rock City as a kid. When i got into the paint business seven or eight years ago, I wondered who painted those things. Now, I do." 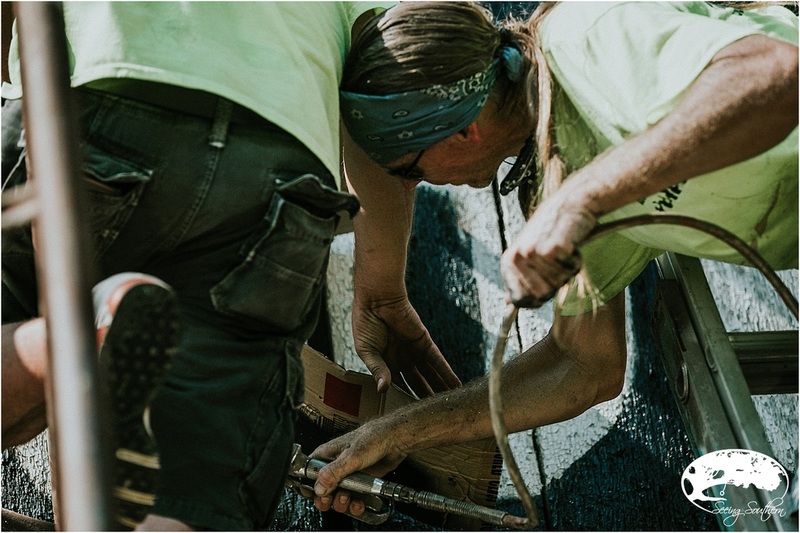 When you speak with Scott, the emotion resonates about just how historical and important this painting gig is. 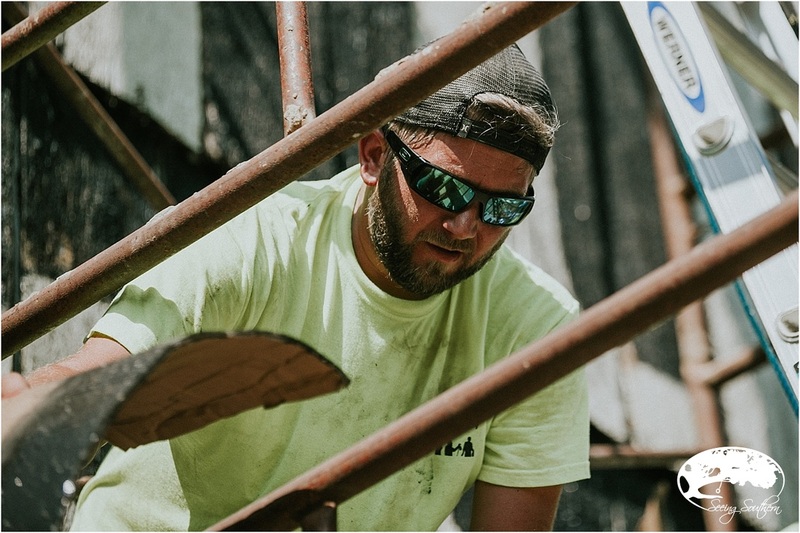 "Every time I come out here and get on one of these barns, I feel a piece of history running through me while I'm doing it. I have five kids. I've told everyone of them about it. My little one, when he sees a Rock City barn, he says, 'My daddy paints those.' My younger ones are always bragging about it. We'll be driving down the road, and one will ask, 'Daddy, did you paint that one?' I'll say, 'No, not that one yet, but I will." He knows his history. When he painted the big one in Knoxville, he heard about the legendary painter Clark Byers from an 80-year-old man who watched Byers paint it. "He was standing right beside him. And now, he' standing there watching me. I'm rewinding history. He said he (Byers) got out there with a ruler and a tape measure and went to work. And a big yard stick and went to work and finished it." It's much different that that now, but they like to spray it so not to damage the surface, keeping the natural look. "I love it. It's hot. At the end of the day, it's worth it. When we ride bikes by here, people know we did it." Hopefully, this barn will remain standing for 90 more years, and people will be talking about Scott as he talks about Byers. "It feels good to be a part of history." The project started around 8:30 a.m. and now, it's about 3:30 p.m. It's around 95 degrees. The painting is complete, and even though it's so hot you could fry an egg on the hood of a car, there's pride, joy and smiles everyone you look. Why is this significant? Why should we care about these barns? Elizabeth Cross says it best with tears in her eyes and a lump in her throat: "It's huge for Robert's family. There's so many memories not only for him, but for his cousins that came to the farm. 'I remember playing in the hay loft or I remember picking up eggs.' It's a huge part of the memories of this family. It's also huge for the people that drive by and see the landmark. It's important that we preserve it. It's a kind of history that's not around as much anymore. We're losing a part of that old time Southern charm." Robert and Elizabeth Cross; Brian, Chandler, Scott, Miguel of H & M Painting. 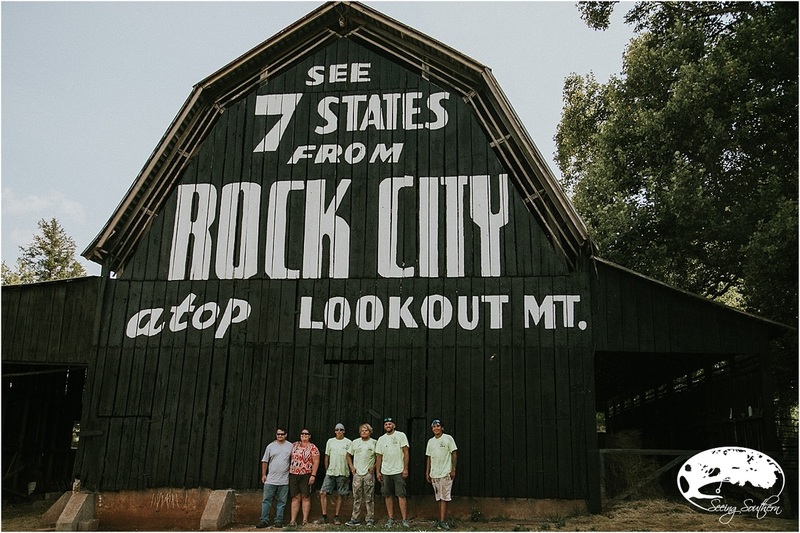 To learn more about Rock City, its history and the famous advertising barns, visit their website. And please, visit ROCK CITY soon!